There’ll be a longer update (or updates) from me later this week, but for now here’s the latest illustration I’m working on. It was inspired by thoughts of all the incredible buildings and settings in the Lord of the Rings, and also memories of reading Mervyn Peake‘s Gormenghast trilogy a few years ago. I love the messy, organic way that old medieval towns grow, so adding that to a stone mountain that walks didn’t seem like a big jump. A lot of people have said it reminds them of work by Hayao Miyazaki and the output of Studio Ghibli, the amazing Japanese animation studio. Oddly, although I know of Myazaki and Ghibli, I’ve only ever seen about five minutes of any of the films. I really should make an effort to see more. I think I’m just about done colouring. I’ll step away for now and see how it looks in a few days. 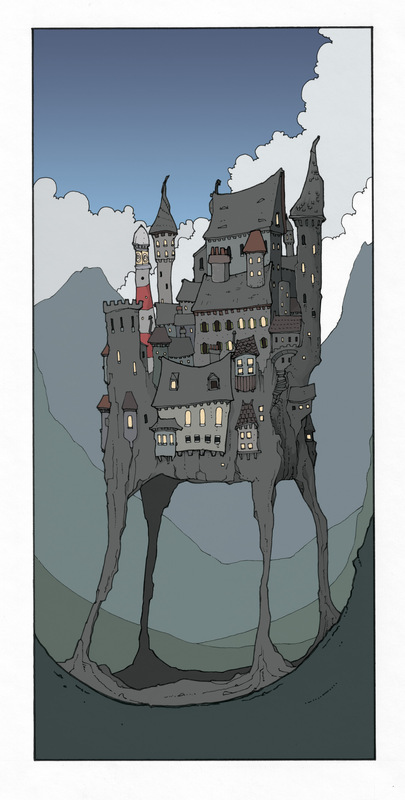 Final (probably) coloured version of Walking City.